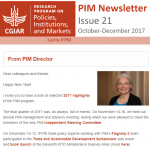 Collection of PIM's news and updates for the last quarter of 2017. 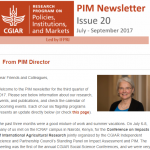 Selected publications, call for papers, PIM webinars, calendar of events, and more. 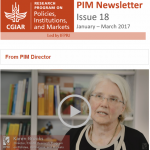 In this issue: Information about our research, events, and publications in the past three months, calendar of upcoming events, and the new PIM Outcome Note summarizing achievements of our social protection work. 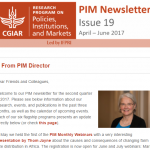 Each of our six flagship programs presents an update for the third quarter 2017. 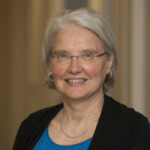 Information about our research, events, and publications in the past three months, as well as the calendar of upcoming events. Each of our six flagship programs presents an update for the second quarter 2017.